Patient safety awareness week is March 11-17, which this year occurs at the same time as the Right Care Alliance campaign targeting insulin prices. At first glance you might not think these two events are related, but as an active patient safety advocate and member of the Right Care Alliance, I believe that insulin prices are a patient safety issue. Here’s why. When I graduated from nursing school in 1970, the price of a vial of insulin was just a couple dollars. Insulin is a life, limb, eyesight, heart, skin, foot saving medicine for diabetics who are dependent on it. Without it, the heart and circulation are harmed and many patients lose limbs. Patients can go blind and kidneys can fail. Skin integrity can be compromised in the form of skin ulcers. Healing is sluggish or impossible. Infections are common and harder to treat. Diabetes is a pervasive disease, but it can be treated and well controlled with medication (insulin), diet and exercise. Type I, insulin dependent diabetes can affect people of all ages including children, and is the most severe form of the disease. About 7 million Americans rely on insulin. We have had insulin for almost a century. It was developed in 1921. The patent rights were sold just a few years later for $3. 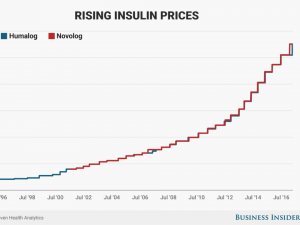 The PATIENTS rights to affordable insulin were sucked up by big Pharma in the past few decades. So, we have gone from a couple dollars for a vial of insulin to $200 or $300 for that same vial. This is such an egregious abuse of patients and their pocketbooks. Like dialysis, patients cannot live without it. They will suffer the effects of uncontrolled diabetes and probably death if they are Type I diabetic and they cannot afford Insulin. This is a huge Patient Safety issue. The industry that produces this medicine deserves to make money. They are making life saving medicine after all. But, do they have the right to price it so high that many patients are forced to go without or to ration it? Should patients suffer or die because they can’t afford necessary medicine? Certainly not. Even with prescription insurance, benefits cap out way before the end of a year and then patients are forced to pay most of the costs themselves. There have been baby steps to cover more patients for this kind of life saving care and medicine. The ACA allowed kids up to 26 years of age to stay on parents insurance coverage, and they eliminated the preexisting conditions exemption or up pricing. But, even with that, most average citizens 26 and over, cannot afford an additional $300 to $600 a month for insulin and diabetes supplies. Even copays cap out and they may end up paying out of pocket before the end of the year if they have prescription coverage. No Insulin dependent diabetic should be forced stop taking or rationing their insulin. This guarantees a bad outcome or death. This is the worst and most preventable Patient Safety breach of all, and just to feed the greed of big pharmaceutical companies. Perhaps it is time for Federal regulators and CMS to look at Type I diabetes the same way they look at Chronic kidney failure. Insulin for diabetics is the same as dialysis for CKF patients. It is a means for survival. Everybody should be covered for that lifesaving care through Medicare, regardless of age, and the price of treatment should also be regulated. We must find a way to control corporate greed and to stop manufacturers from pricing medicine so high that patients in need cannot afford it. We in the Patient Safety movement have worked toward transparency and accountability in healthcare. We have pushed for increased reporting of healthcare harm and we can do this with the pharmaceutical companies. We can go after State or Federal legislation that requires reporting of any patient who has died because they could not afford their insulin. We have networked so that we can always find a voice for any relevant newspaper, TV or radio news interview or investigative report on a patient safety issue. We have infiltrated all pertinent government committees, private and public conferences and events, by submitting abstracts, and becoming part of the program when possible. Sometimes we simply attend and we aim to bring the patients voice to the conversation. We have picketed outside of hospitals and events where we were not particularly welcomed. We have worked with Federal and State agencies who write the rules and recommendations and who fund them. We volunteer on patient advisory boards for government agencies, Hospitals, and medical organizations. We work independently and with each other to help the work toward elimination of healthcare harm. It’s time to pull together and target the Pharmaceutical Industry, because their greed is harming patients. Precisely what is blood insulin? In popular text, blood insulin is among the most significant human hormones, manufactured in the pancreas. Blood insulin helps continue to keep regular volume of blood sugar with the circulation, as a result it allows you divide carbohydrate food and glucose. Basically, including bodily hormone of blood insulin carries a purpose of vigor variations in our organism. Having said that, this blood insulin proceeds no place guy offers a level of resistance of cellular material in this chemical.